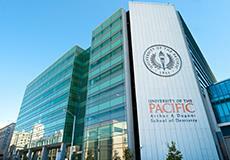 First and Last days are held in person at University of the Pacific, Arthur a Dugoni School of Dentistry. More event details will be sent upon completion of registration. The RDHAP course was designed for dental professionals wanting to expand their knowledge and ability to treat people with special needs who may have complex medical, psychological or social situations. As California's population continues to grow, it has become one of the most diverse in the U.S.. Promoting oral health is becoming increasingly challenging. The program is primarily web-based and was designed to reach professionals in both rural and urban areas. Two in-person sessions will allow students to meet their peers and instructors. To successfully complete this program, students will be required to attend the two in person sessions (first and last day), complete online lectures, quizzes, case reports, and pass the final exam (administered on the last day). Upon completion of the course, DHCC will be notified of participant's attendance and course completion. Upon registration: Students will receive program instructions and details of the first in-person day. Students will be expected to complete six sections of online modules that include presentations and their respective quizzes. Each section contains four to seven modules. Students will also complete online clinical case reports; these case reports consist of a presentation of a clinical case with history, charting, photographs and radiographs. Students will than participate in an online group discussion to evaluate each case. This program is open to any oral health professional interested in oral health for people with complex needs and is not limited to individuals who will be applying for the RDHAP license. University of the Pacific, Arthur A. Dugoni School of Dentistry is one of the nation's premier dental schools and has served the Bay Area community for more than 100 years. The dental school is committed to excellence and innovation in education, research, community service and patient care. The Pacific Center for Special Care is an organization within the Arthur A. Dugoni School of Dentistry committed to improving the oral health of underserved people on the local, state and federal level. This activity is designated for 39.5 units of continuing education credit. Payment Plan: If you opt for the payment plan, you will be billed in 2 installments of $1500 due by January 17th. Paul Glassman, DDS, MA, MBA, is a professor in the Department of Dental Practice, director of Community Oral Health and director of the Pacific Center for Special Care at the University of the Pacific, Arthur A. Dugoni School of Dentistry in San Francisco. He is also director of the California Statewide Task Force on Oral Health for People with Disabilities and Aging Californians. He has served on many national panels including the Institute of Medicine's (IOM) Committee on Oral Health Access to Services which produced the IOM report on Improving Access to Oral Health Care for Vulnerable and Underserved Populations and the Board of Directors of the DentaQuest Institute.